More People Search for "Attorney" than "Lawyer"
"Hands down, consumers favor the term attorney over lawyer when they are searching," says Mark Sprague, a Boston-based information and software product entrepreneur who writes for the Search Engine Lane blog. This is a very handy bit of marketing information for lawyers to use when they are writing blogs, online articles, web bios, LinkedIn updates, tweets, Facebook pages and any kind of Internet content. 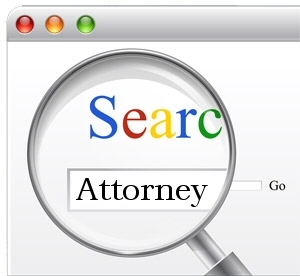 Use the keyword attorney so that you'll turn up in more online searches. Interesting human behavior is shown when people search for an attorney or lawyer. They begin by researching their legal issue. "They are doing information searches using a lot of vague terms, but you do see specific request for advice, reviews and rankings," Sprague says. This makes sense, because people will search to solve their problem first before deciding to contact a lawyer. The marketing tip is to fill your blog and website with FAQs which describe a potential client's situation, explore the damages and adverse effects the problem causes, explain how much the solution will cost and spells out how the lawyer will solve the problem. For example, a personal injury lawyer should describe paraplegia, explain how much it costs to live in a wheelchair, and spell out how the attorney will recover those costs. Look for a type of attorney, specifying it by practice. Look for a source to help with the selection process. They are using terms such as directory and list. My employer, Lawyers.com, is the top cited online legal resource mentioned by consumers who sought an attorney in the past year, following Google. Seek value, looking for lawyers using terms such as top, new and best. Inquire about a particular law firm by name. Look for a law firm by location. The most sought-after practice are, in order, personal injury, criminal attorney, family law, medical malpractice, bankruptcy, immigration, DUI, accident and divorce. Knowing this, you can exploit how people search in your website copy and pay-per-click campaigns, Sprague says. "Consumers favor the term attorney over lawyer. You should use both, but attorney should be the dominant term in your web page copy." Larry Bodine is a Business Development Advisor based in Glen Ellyn, IL. He has helped law firms generate millions in new revenue by devising strategies, conducting business development retreats and individually coaching attorneys. He can be reached at 630.942.0977.